NodeMCU is a LUA based interactive firmware for Expressif ESP8622 Wi-Fi SoC, as well as an open source hardware board that contrary to the $3 ESP8266 Wi-Fi modules includes a CP2102 TTL to USB chip for programming and debugging, is breadboard-friendly, and can simply be powered via its micro USB port. The hardware documentation for the board can be found on nodemcu-devkit repo, including schematics and PCB layout designed with Altium Designer, but they should also be compatible with the cheaper Altium CircuitStudio. Sadly, the files have not been updated for 3 to 4 months, so they don’t completely match the latest hardware shown above, and some pins were not connected in the earlier version. 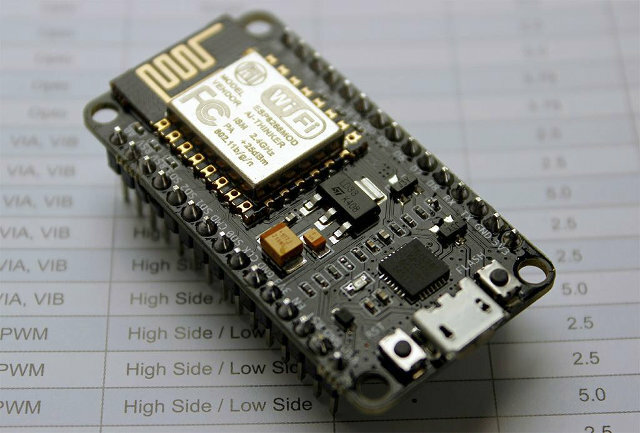 NodeMCU can be purchased for $10 and up on Aliexpress or Seeed Studio. However, it’s not entirely clear which version of the board is sold… The Aliexpress shop shows hardware v0.9, but says they will send the latest version, while Seeed Studio mentions NodeMCU “v2”, and shows picture of v1.0 hardware, which should be the one you want. The new board will also be up for sale in Europe on nodemcu.eu for 15 to 18 Euros including VAT. Great, I have to buy an new one then :), Guess I need to order from Seeed, the ones I have, came from Aliexpress a couple of days ago. Another ESP8266 kit with 3x AAA battery holder. Too bad it’s not a real enclosure. Not 100% sure of the version however. I bought one. I’ll see. 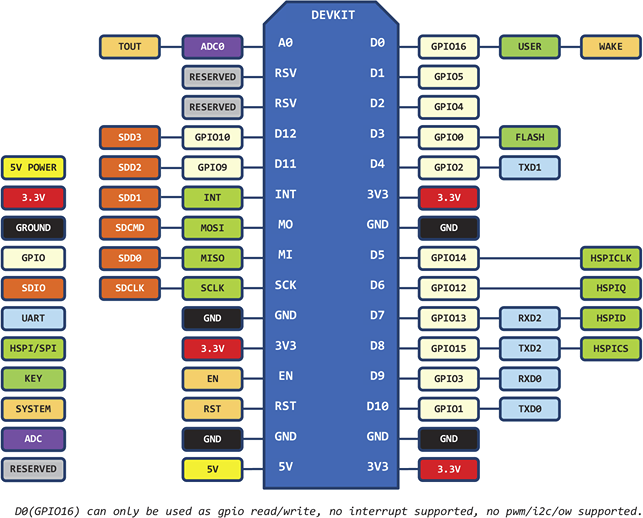 Is there any pin compatibility to any cpu-board like Arduino Uno, Nano a.s.o. ??? Or is there salad of lines nessesary in real cpu-life (out of experimental envirement)? Option 2, use two breadboards side by side. @neslekkim Hello I used two smaller breadboards and mounted these on either side if the NodeMcu and glued this on top of a larger breadboard. That way the pins on each side become available for more leads connected to each pin. please tell whats wrong with him? each time I plug the nodemcu on a breadboard, each time I have got an exeption. It disapear if the nodemcu is alone, powered by USB. I think that the breadboard introduce perturbations on the inputs and provoque the calling of an non-implemented interruption. I think that a pull-down on all the pins could solve the problem. Perhaps only few i/o are concerned, but which one ? Looking at the above image, why is rxd1 missing, every other txdn has an rxdn (see [txd0, rxd0], [txd1, ?] , [txd2.rxd2]) I’m assuming those are serial port ? also does txd0 is the main serial output after reboot? does the board also has a watch dog timer to prevent lockup ?